In this sequel to Don’t Let’s Go to the Dogs Tonight, Alexandra Fuller returns to Africa and the story of her unforgettable family. In Cocktail Hour Under the Tree of Forgetfulness Alexandra Fuller braids a multilayered narrative around the perfectly lit, Happy Valley-era Africa of her mother’s childhood; the boiled cabbage grimness of her father’s English childhood; and the darker, civil war- torn Africa of her own childhood. At its heart, this is the story of Fuller’s mother, Nicola. Born on the Scottish Isle of Skye and raised in Kenya, Nicola holds dear the kinds of values most likely to get you hurt or killed in Africa: loyalty to blood, passion for land, and a holy belief in the restorative power of all animals. Fuller interviewed her mother at length and has captured her inimitable voice with remarkable precision. Cocktail Hour Under the Tree of Forgetfulness is as funny, terrifying, exotic, and unselfconscious as Nicola herself. A story of survival and madness, love and war, loyalty and forgiveness, Cocktail Hour Under the Tree of Forgetfulness is an intimate exploration of the author’s family. In the end we find Nicola and Tim at a coffee table under their Tree of Forgetfulness on the banana and fish farm where they plan to spend their final days. 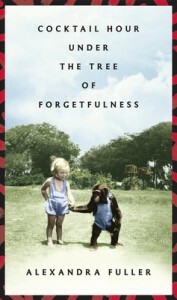 In local custom, the Tree of Forgetfulness is where villagers meet to resolve disputes and it is here that the Fullers at last find an African kind of peace. Following the ghosts and dreams of memory, Cocktail Hour Under the Tree of Forgetfulness is Alexandra Fuller at her very best.